When you need a little work on your short game, it is always nice to find an decent executive course. 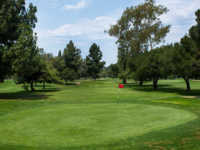 You will find great Long Beach golf deals at Heartwell Golf Course in Long Beach, Ca. This 2,143 yard course is conveniently located a short driving distance from major airports in Long Beach, Orange County and Los Angeles. Heartwell Golf Course was designed by William F. Bell and opened for play in 1964. The course has 18 par 3 holes ranging in distance from 80-140 yards. The course has a rating of 50.1 and a slope of 90. The fairways consist of Bermuda grass and the greens are designed with Poa grass. This short course has two water hazards as well as several green side bunkers. If you need Long Beach tee times, you can reserve your Heartwell Golf Course tee times via the internet or by calling the course starter. As with most executive courses, the play is fast and the reservation times are abundant. The amenities include a nite-lit driving range, putting green, club rental and dining facility.